<blockquote> Sugar Ray – "Fly"
Missy Elliott – "The Rain (Supa Dupa Fly)"
Weezer – "Undone — The Sweater Song"
Eminem – "The Real Slim Shady"
The Beastie Boys – "(You Gotta) Fight For Your Right (To Party!)" The Hives – "Walk Idiot Walk"
Soundgarden – "Black Hole Sun"
Korn – "Freak On A Leash"
Britney Spears – "…Baby One More Time"
Green Day – "Good Riddance (Time Of Your Life)"
It's been a couple years since FIDLAR released an album, but we're excited to say that's about to change. The band's sophomore record, Too, is expected to release in early September of this year, but until then, they're keeping us entertained with singles such as "40oz. On Repeat." Even if FIDLAR isn't your cup of tea, the music video itself is still a hilarious must-see. Most of FIDLAR's songs tend to lean toward the surf-bum lifestyle and "40oz. On Repeat" proves no different. They question their social skills and ability to make money, then shrug off responsibility, singing, "I’m gonna lock myself inside my room, with this 40 ounce on repeat." The song is self deprecating and playful, with a chorus resembling music from a jack-in-the-box. The video is even more amusing. Poking fun at music from the past decades, the band recreates old videos from artists such as Britney Spears, Eminem, Weezer, and Oasis (see the full list above in VIDEO REFERENCES). Too is available for pre-order on their website (which also has a sweet GIF maker for this music video) and iTunes. 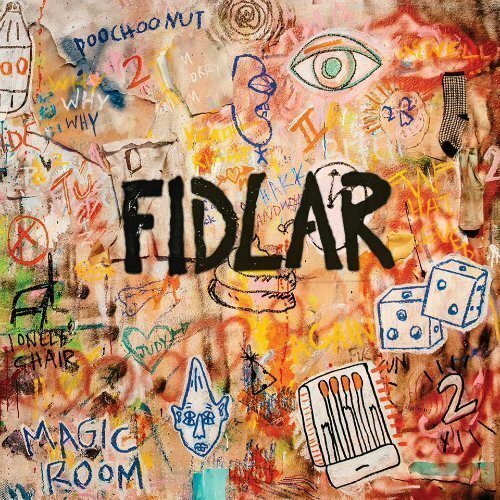 FIDLAR's 2013 self-titled debut record is available on Amazon (Vinyl, CD, MP3). You can also stream the album for free and read our review here on Zumic. For FIDLAR's latest music, news, and tour dates, check out their Zumic artist page.